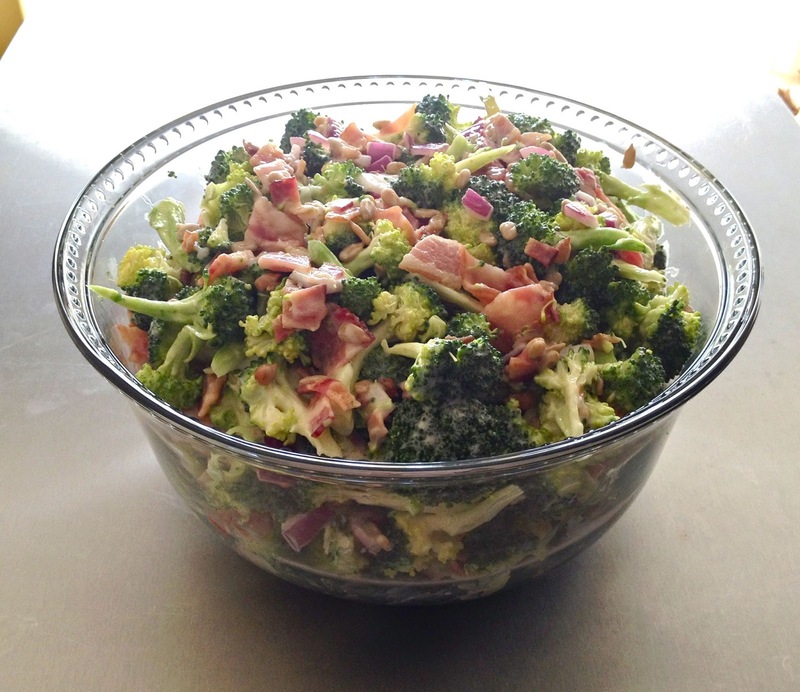 Whenever the holidays roll around, I'm usually in charge of preparing this broccoli salad. From my very first bite ever of this salad, I knew it would become a regular in my Holiday meal repertoire. Each bite is insanely flavorful and delicious. The dressing is what marries the ingredients so perfectly together with its tangy sweetness. Wash and cut broccoli into bite size pieces. Place in large mixing bowl. Dice red onion and add to broccoli. Oven: Preheat oven to 400 degF. Line bacon strips on a foil covered baking sheet and cook bacon for 8-10 minutes. Microwave: Place one layer of bacon on a paper towel lined microwave-safe plate. Cook for 1.5-2 minutes. Repeat. Skillet: Line skillet with one layer of bacon and cook each side of bacon for 8 minutes each on low-medium heat. Repeat. 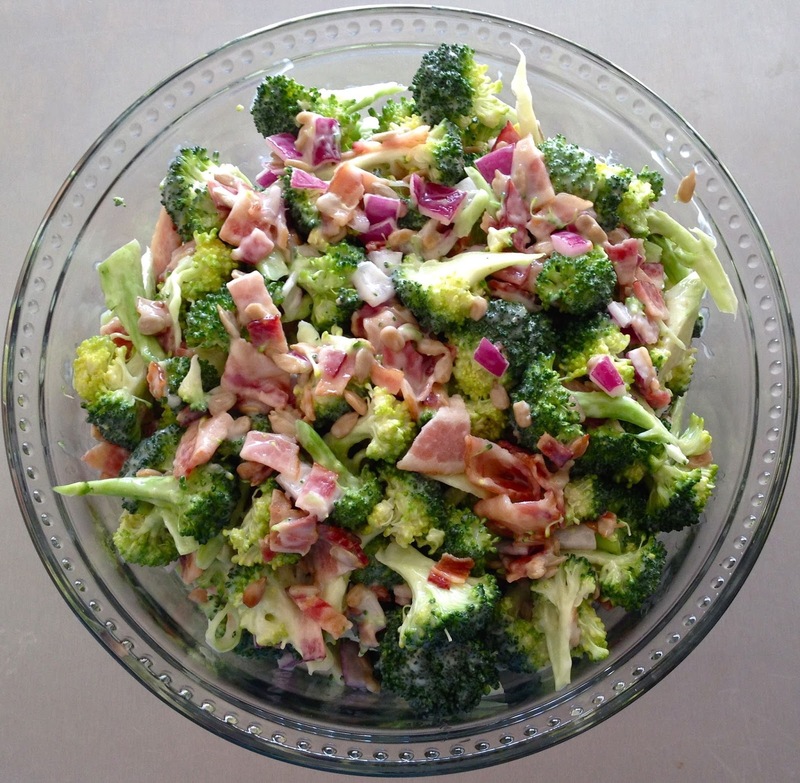 Once bacon is cooked & cooled, cut into small bits and add to broccoli mix. Add sunflower seeds and raisins (optional). In a small bowl, mix together mayo, apple cider vinegar and sugar until well incorporated. Pour dressing over salad and mix well. Cover the salad with plastic wrap and let it chill and marinate for at least 1 hour. When you are ready to serve, carefully transfer salad into your trusty serving bowl for a beautiful presentation. I believe that everyone should invest in at least one large serving bowl to present different dishes elegantly. They work great for salads, pastas, stews, desserts, you name it. Here are some Fourth of July serving bowls & utensils that I love and all are under $40! Hope you enjoy this recipe as much as I do! Have a fun & delicious Fourth of July!! Oh my, this looks delicious! Definitely going to have to try it for the barbecue tomorrow! Oh my gosh this looks so good I will be making for a dinner party this weekend. Thank you for sharing with us! Thanks for the recipe. I'll have to try it out this weekend. I love broccolli but rarely have it in salad so I will try this out! I'm starting to get hungry! Lol. This salad looks so refreshing and so delicious.I *-* really love all salads but this one looks so tempting and colorful in the picture.I going to make this one.Thanks for sharing. I'll be packing this for lunch tomorrow. Looks so good! This salad looks so good. I will try it. I need more vegies in my diet! Thanks! This broccoli salad looks delicious. I have never used sunflower seeds in my broccoli salad,but it sounds good. I will be trying this recipe soon. This is one of my favorite recipes. I haven't used turkey/bacon before and I am sure that would be a great addition.